The approach to Almeria is stunning: the town lies surrounded by semi-dessert at the foot of a range of mountains and its coastline alternating by long sandy beaches and steep cliffs. Ships dock in the main harbor, Muelle de Levante, a 10 minute walk (1km) to the city center. Almeria is mostly used as a port to visit Granada, but one can easily spend the day here. The name "Almería" stems from Al-Mariyat: "The Mirror of the Sea", in Arabic. The city has a North African flavor with white Moorish-style houses and the crumbling Castillo de San Cristobal, overlooking the harbor. If you plan to climb up to the splendid Alcazaba (fortress) be warned that there are some 200 steps. Beaches: The Costa de Almería provides both developed tourist resorts to the west and relatively untouched natural areas and coves to the east. There are naturist beaches in Vera. There are also traditional fishing ports and marinas to explore. Mojacar Playa (beach) consists of over 5 km of bars, hotels, restaurants, shops and cafes. The development of these beaches extends along the coast to Garrucha. The town is on a hill so there is quite a bit of uphill walking. Taking the train or bus to Granada will take more than 2 hours. The Desert of Tabernas, because of its similarities with the North American deserts like the Far West of the American West, northern Africa, the Arabian deserts, and its lunar landscape, served from 1950s and is still used today for the shooting of many films and westerns. The spaghetti westerns were shot at the three main studios, Texas Hollywood, Mini Hollywood, and Western Leone. Mojocar It is 90 km from the capital of the province, Almería. It is an elevated mountain village displaying the traditional white color from its earlier days. There a plenty shops within walking distance from the center. 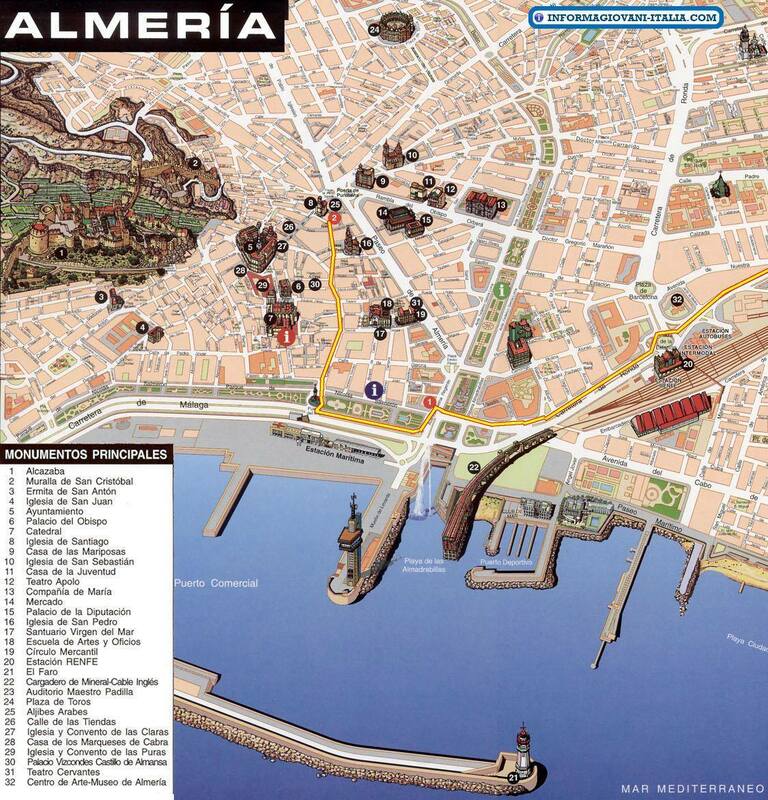 Almeria is also well-known for its restaurants and local cuisine. The best place for reasonably priced restaurants and bars is around the Puerta de Purchena at the end of Paseo de Almeria. In the old town you can find many good bars and cafes near to the town hall. Gastronomic specialties include "Gurullos" (stew with pasta), "Trigo" (stew with grains of wheat, pork, beans, and herbs), "Gachas" (hot and spicy clam stew) and "Escabeche e Sardines" (fresh sardines in hot sauce).